The founders of Chrysalis have officially launched affordable fast-fashion jewellery brand ‘Ania Haie’ at Vicenzaoro. Set to be one of the ‘brand’s to watch’ this year, our editor Stacey Hailes made sure she was first in line to meet with the team and found out how Ania Haie has been designed to drive footfall, boost sales, and keep store window displays looking fresh. It’s not everyday a brand launches with a point of sale which is just as striking as the products itself, but then again, Ania Haie is no ordinary brand. With founders at the helm who have ‘been there, done that, and got the T-shirt’, Ania Haie has been created with a recipe for success. Every little detail has been carefully thought through, and a dedicated team has been put in place to make sure Ania Haie hits the ground running online and in stores. This includes eye-catching displays, an abundance of marketing materials, and a concept which brings jewellery up to date to with the fashion industry. Launching at trade show Vicenzaoro in January, and officially in the UK at Jewellery & Watch, Ania Haie is a fashion jewellery brand retailers need to know about this year. In a nut shell, Ania Haie is a stylish new affordable brand, created by the founders of Chrysalis. Andy and Dave Maine launched Chrysalis in 2007, and have seen the brand go from strength to strength, and now the jewellery moguls have a new idea, which is set to take the market by storm. The key concept? The brand will launch new collections every month. Just as often as new ranges launch, previous ones will discontinue, with the idea being that consumers will soon learn not to hesitate to buy a piece they like, and to keep looking in store for more. In addition, as the jewellery is being created in the company’s dedicated production facility, all pieces can be retailed at affordable price points — tapping easily into both the self purchasing and gifting markets. With a concept of constant change, Ania Haie should be music to the bricks and mortar retailers’ ears. As high street retailers battle with online stores, it’s important to keep windows fresh, and give consumers a reason to keep coming back for more. As Ania Haie grows, and it should grow quite rapidly with the marketing strategy the team has in place, customers will know that a store stocking the brand should have new stock on a regular basis, and will therefore be more tempted to look inside. Furthermore, the affordable price points means many consumers will be able to buy as often as they come in and look. 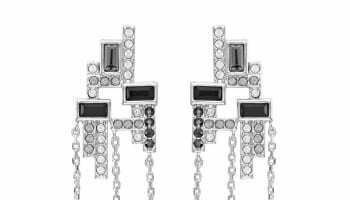 “Jewellery retailers are competing against fashion stores such as H&M, which are constantly introducing new products and changing the fashion looks in store, so we are doing the same concept with jewellery. Because the whole concept revolves around introducing new designs, consumers will know if they don’t buy it then, then they are not going to get it, and they will keep looking online and in store for updates,” explains Maine. This idea in the fashion industry has been dubbed the ‘Zara effect’, and jewellers have long been wondering how they can keep up. If every other store on the high street is revolving its windows and introducing new products monthly, weekly or even daily, how can the jewellery industry compete? Ania Haie will also stock best sellers until sales decline, so retailers will constantly be able to cash in on top selling designs too. Ania Haie will launch new designs every month. The jewellery pieces have all been crafted in sterling silver, with rhodium and 14ct yellow and rose gold plating. Leaving no trend behind, there is no product category Ania Haie wouldn’t tap into, with the debut line offering a wide variety of rings, necklaces, chokers, cuffs and earrings which can be layered, stacked and worn multiple ways. To kick off the launch, Ania Haie will be starting with nine collections including ‘Out of this World’, a mix of orbital pieces, ‘Modern Minimalism’, a discreet and pared-down range, ‘Touch of Sparkle’, which features shimmering elements that resemble the night sky, ‘Links’, a feminine take on the classic chain design, ‘Geometry Class’, a collection of angled and symmetrical pieces, ‘Connect The Dots’, featuring little bursts of enamel colour in turquoise, navy and coral, ‘Texture Mix’, which brings silver to life through a mix of texture, ‘All Ears’, a blend of earrings designed to be mixed and matched; and ‘Coins’, which celebrates the brand’s ancient trade routes. All together the first selection of designs are intricate, minimal, and easy to wear. 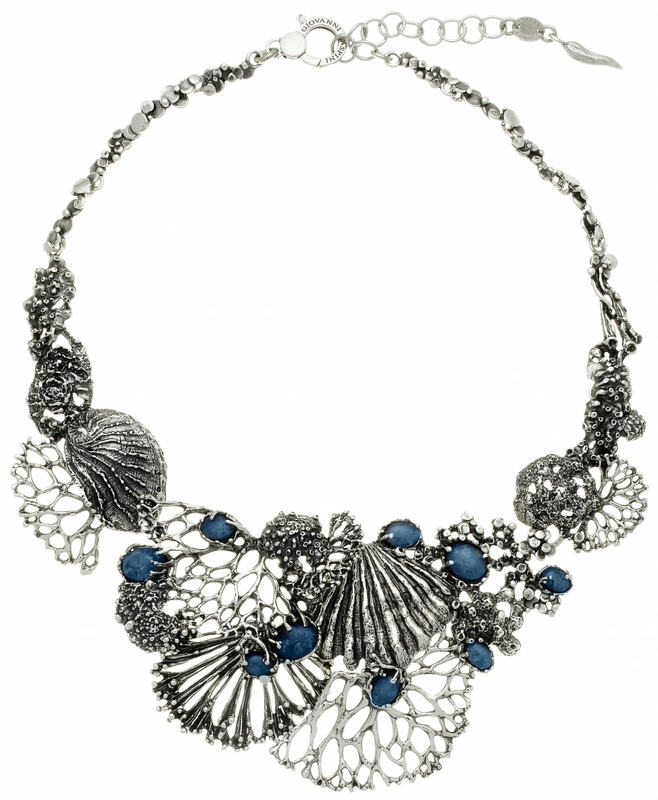 Looking ahead, the brand has plans to introduce semi precious gemstone adornments, and striking, show-stopper pieces. “Shiny gold is going to be quite a key trend next year,” shares Maine, who at the time is modelling how all the collections work well mixed together. Pieces retail from £15-£89, with the average product varying between the affordable price range of £35-£50. POS will feature marble details and gold lettering. With new additions being added to the brand every month, the founders understand it is incredibly import to support its stockists, and as such has spent time making sure everything from the bag each sale goes in, to the team behind the brand, is ready for the official launch of Ania Haie. The brand’s point-of-sale is bound to be a talking point in the stores it resides, because it is just as eye-catching as the product itself. In-store displays feature real marble and gold details to striking effect. Not only are all the displays of an extremely high quality, but they visually stand out and feature practical elements to help retailers keep everything looking as good as new. Various sizes are available, as well as alternative options for fashion boutiques which may have different demands to jewellers. All displays feature lifestyle imagery, which will be changed over as often as new products are introduced — re-enforcing in the consumers’ mind that there is something fresh to be found. Later down the line, Ania Haie will also be introducing digital screens, which will help jewellery retailers show consumers the full breadth of products available to them. Ania Haie will be backed by strong digital marketing campaigns. In terms of jewellery offering, the brand will offer retail partners a strong selection of products, so each store can play with what works for them. Alongside launching new products, the brand will also introduce promotions during key events to help retailers drive sales at key selling times. These will include promotions such as offering a special gift when a customer buys two or more products, and doing competitions where jewellery pieces can be won. Alongside promotions, and staff support, Ania Haie will also be backed by a strong marketing campaign, which retailers will have full access to. Giving the target market for the product, digital and influencer marketing will be extremely important to the brand’s success. Ania Haie is working with key leaders and influencers to drive the brand’s message to a mass market. This will be integrated into a social media content strategy, which will enhance Ania Haie’s reputation, and further spread the word that there is a new fashion brand in town. The company will primarily focus on visual branding platforms such as Instagram and Facebook, which have been proven to bolster sales for jewellery brands. The team will also use real time engagement platforms including Snapchat and Instagram Stories, because these are becoming increasing popular channels for capturing the millennial market. All content will be creative, and relatable, while also offering call-to actions such as giveaways, flash offers and games. When it comes to influencers Ania Haie is collaborating with UK and international micro and marco fashion bloggers on Instagram with 10K to 500K+ followers. These partnerships will be organised throughout the year, with the brand choosing carefully who it works with, and encouraging each individual influencer to find and create their very own Ania Haie style. Already, London-based influencers are wanting to wear and promote the brand. Ultimately, key digital platforms will be used to keep important audiences engaged with unique creatives, whilst also pushing sales and purchase intent. 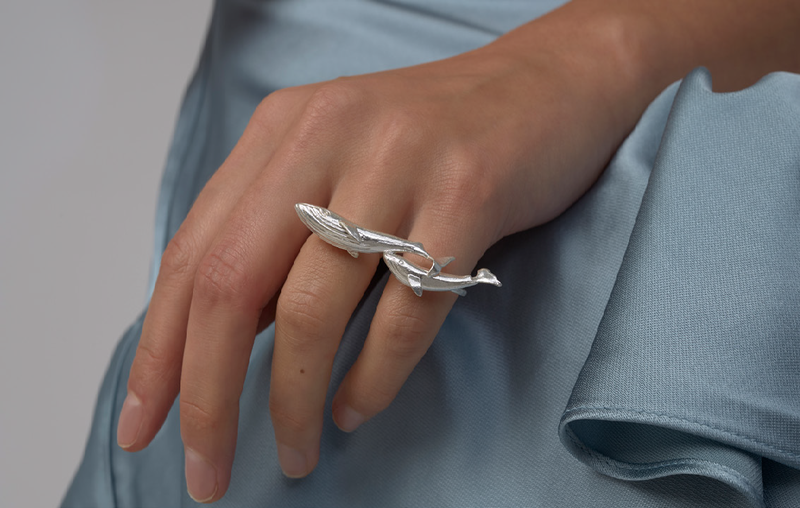 Ania Haie will also be partnering with national press to maximise brand exposure and position Ania Haie as the new fast fashion go-to jewellery brand. The founders will showcase Ania Haie at Jewellery and Watch. Retailers in the UK & Ireland have already shown interest in Ania Haie, so the founders are confident the brand will get off to a successful start. Despite lots of interest, the team are in no hurry to open doors for the sake of adding stockists to the new brands portfolio, rather they are going to be very careful with where they place Ania Haie. While Ania Haie is different to Chrysalis, the founders are also very aware that the brands complement each other. Chrysalis is all about meaning and sentiment, and this year will be introducing more fashion-influenced designs, where as Ania Haie is purely trend driven. With the two perfectly capable of going hand in hand, and even strengthening one another, Chrysalis customers will have priority when it comes to stocking Ania Haie, but the team are also really excited to partner with new retailers – whether that will be jewellers or fashion boutiques. With a buzz already being created around the brand, both among trade professionals and consumers, all that’s left to do is officially launch and watch sales soar.